The weather is getting warmer here in NYC which means the Summer Edition of one of my favorite colognes has hit the shelves. Each summer, since 1995, Issey Miyake has released a summer edition of his classic L’Eau d’Issey Pour Homme. The summer editions, which are limited and only available through September, give a nod to the original by adding a new twist to the mix. 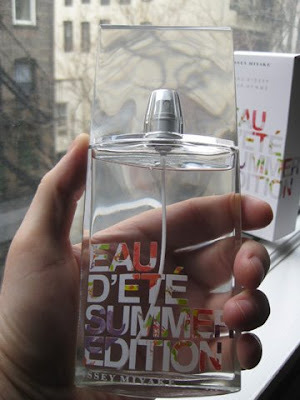 The 2009 L’Eau d’Issey Pour Homme Summer Edition is my fav of the summer editions. And check out the icy-urban-cool bottle. I was into with the original L’Eau d’Issey when it came out in 1994. L’Eau d’Issey was groundbreaking at the time — an unusual blend of aromas that redefined what a masculine scent would be. Subtle, smooth, sensual, and fresh with a hint of Japanese citrus. It became my signature scent and I’ve gone through several bottles of the original — it’s a great versatile scent. Subtle enough to wear daytime and warm enough to wear in the evening. L’Eau d’Issey 2009 Summer Edition uses a different type of alcohol which helps the cologne to be more in sync with the warmer weather. It opens with icy yuzu and mandarin orange and finishes with a blend of cardamom and sage. The edge is balanced with vetiver and ambergris. Summer edition is $57 and is available now at Bloomingdale’s, Nordstrom, Macy’s, Dillard’s and Sephora. I am a fan of Issey as well. Sounds like a definite winner. Yes, it's a winner... very close to the original and nicely balanced.